Safely and easily provide power to a heated bird bath or stock tank deicer using the Allied Precision Lock N Dry Power Supply Cord. This hardy, UL listed cord has a revolutionary design, making it perfect for use with your outdoor electrical items. A weather resistant seal at one end of the cord creates a water tight connection with the plug on your existing bird bath or deicer, keeping the area safe from the elements. 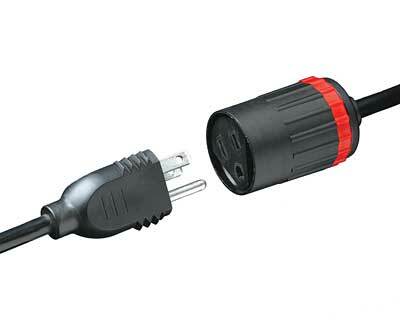 When used in conjunction with a Lock N Dry compatible power cord, the large, black nut covers the full gasket, while a red nut locks the connection in place for a water tight and secure seal. The cord extends to 25', for plenty of versatility in placing your heated bucket or bath, and is safe for use with items up to 1500 Watts. Power your stock tank deicer or heated bucket safely with this Lock N Dry Power Supply Cord.